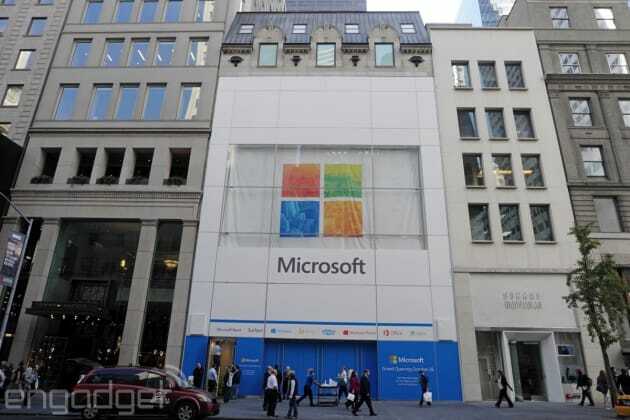 Microsoft's first flagship retail store is opening its doors tomorrow in New York City, located on Fifth Avenue and 53rd Street, just a few blocks from Apple's iconic cube store. This isn't your typical Microsoft store: It spans five floors in a grand building, and it'll sport a glass facade that offers a direct view inside. You definitely won't miss it while walking down the street. Upon entering the store, it's not hard to feel a sense of deja vu from Apple's retail style. There's plenty of hardware spread out for you to fondle on fashionable tables, including Surface Pro 4s, Surface Books, new Lumia phones and a slew of other hardware from Windows PC makers. And there are several "Answer Desks" located throughout the store, which will offer assistance with any piece of Windows hardware, no matter where you bought it. Check out our walkthrough after the break. The store is Microsoft's first to have more than one floor, and it looks like it's putting that space to good use. The second floor features a large community theater, where store employees will hold training sessions and other events. There's also a huge section of the floor devoted to Xbox, and even Minecraft gets some space to shine (along with lots of tempting accessories). The third floor is a dedicated Dell showcase, which will feature a slew of consumer and business hardware. On top of being a great way to show off products for typical consumers, it looks like the flagship store will also be a decent way for Microsoft to promote its partners. If you pick up one of the gadgets strewn about, you'll quickly notice something interesting: No security cables. Microsoft says it wants to demo the devices completely untethered so people can test them out as if they were at home. And yes, there's going to be plenty of security on hand. There are going to be 160 associates working at the store, who speak a total of 19 languages (perfect for the store's inevitable international tourist audience). Microsoft is still trying to figure out a use for the penthouse floor -- but based on what we're hearing, it might end up being some sort of event space. (The fourth floor is all administrative offices.) The front of the store will also sport a two-story tall "culture wall," which will display digital art to all the pedestrians of Fifth Avenue. Microsoft says it will only display non-commercial content on the wall, so don't expect to see any ads there. Microsoft is hoping you won't just stroll through the store -- instead it wants you to pull up a seat and spend some time with Windows hardware. Apple's influence is clear, but there are enough unique elements here to satisfy Microsoft fans, and hopefully make some new ones too.